Beef jerky is something that is great to make yourself. It is a lot cheaper than buying it ready made and you can completely customise it to your own tastes. Living in the UK beef jerky is no way near as popular as it is in the US or Canada which makes making it at home all the more important for me. In this article we are going to take a look at how to make beef jerky. What Cut Of Meat To Make Beef Jerky? 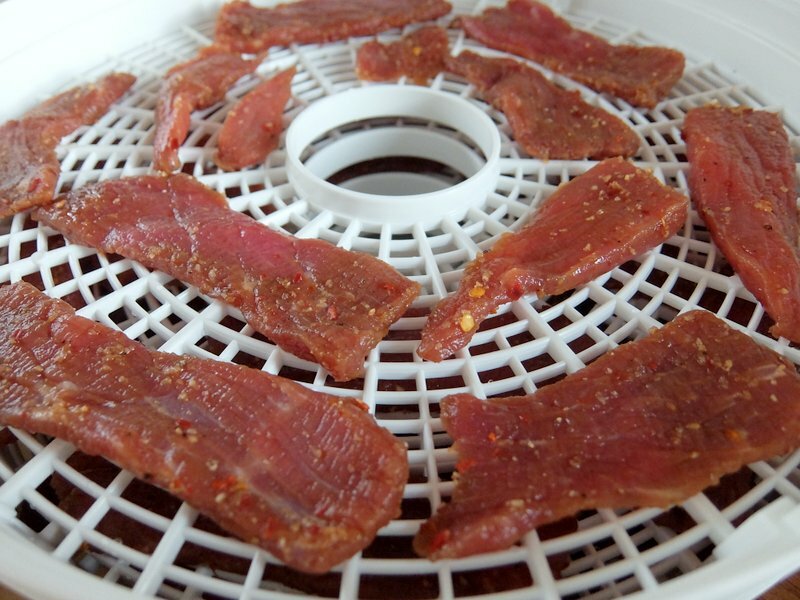 How To Dehydrate Beef Jerky? Beef jerky at is simplest is lean strips of beef that have been dried to preserve them. 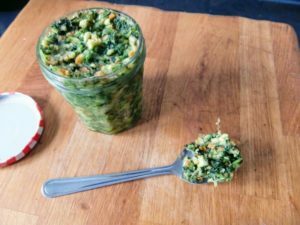 Dehydrating any food was one of the earliest methods of preservation and would have been used by even our ancient ancestors to preserve food for times when various food sources would have been scarce. People would have been drying meat in one form or another for thousands of years in places where the climate was suitable for air drying. When a large animal is hunted and killed it would have been common sense to try and save as much of the surplus meat that was left over as possible. It would have been an easy observation that cutting thin strips of meat and laying them out to dry in the hot sun would stop it from spoiling like the unprocessed meat. Different cultures would have had their preferred method of preserving meat in this way. The name for jerky is generally agreed to have originated in South America. An Inca tribe called the Quechua were preserving Alpaca or Llama meat that they were farming by curing in salt from nearby salt flats and then drying it in strips. The name they had for it was “Ch’arki”. This literally translates as dried meat and it is easy to see how this name could have been corrupted into the name “Jerky”. Jerky today uses the same principles of preservation as people would have been using hundreds of years ago, although, in our modern age we have the convenience of refrigerators and dehydrators of course. First of all, we have a cure (this is just a salt cure, in this case, there are no nitrates in this recipe), this is an important step in the process in terms of preservation of the beef as well as introducing extra flavour. We are calling this a jerky marinade because we are adding flavour to the beef before drying it, but at the same time, we are curing the meat slightly as well with salt. Salt kick starts the process of dehydration because it draws moisture out of foods. At the same time, it also seasons the beef jerky all the way through. One of the most popular marinades and what we are going to do with our beef jerky is to use soy sauce as a marinade. Soy sauce has a high salt content as well as huge amount of savoury flavours. This does the job of salting the meat as our ancestors would have done before drying and boosting the flavour. Along with salt in our marinade in the form of soy sauce, we can add additional flavours. Herbs, spices and sweetness if you want can be added. For our basic recipe here we are adding Worcestershire sauce which is another very common addition to jerky marinades as well as dried chillies, pepper and garlic. Beef jerky needs to be made with very lean beef. Muscle tissue dries out very well but fat does not. If you have fat running through the jerky it will not dry out properly and the fat will deteriorate quickly and go rancid greatly shortening the shelf life. Of course, we do not want this to happen so choosing a lean cut of meat is essential. 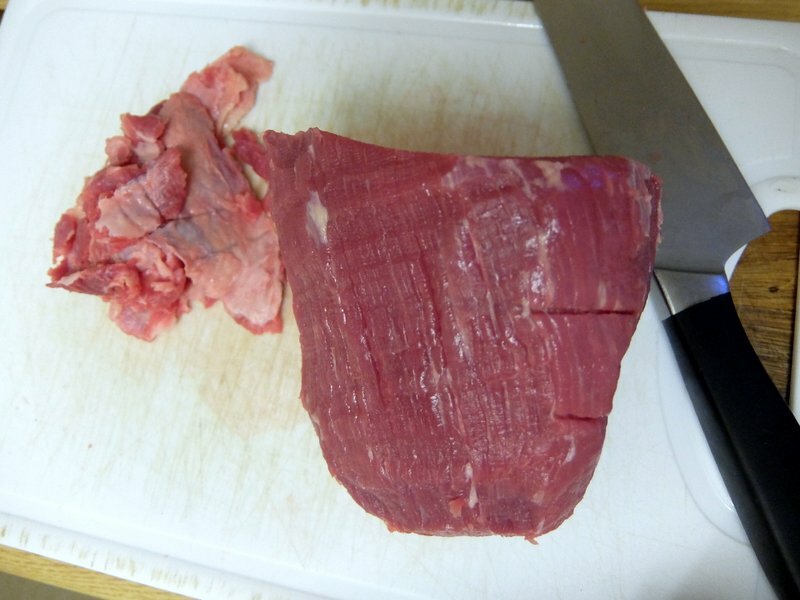 Most cuts of meat you buy will have fat on the outside that can be easily trimmed off. It goes without saying that you should be making jerky with the freshest beef possible and I find organic is always best. If the beef has marbling of fat running through it then use it for something else. We are looking for just lean meat. Historically, making any kind of dehydrated meat would have only been possible in warm, dry climates. Today with modern kitchens we can achieve the same thing fairly easily and in a much more controlled manner. To remove moisture from any food we need airflow to aid evaporation. Having airflow should not be overlooked as warm temperature alone will take much more time to dehydrate food than using airflow to transfer water vapour away from the surface of the meat. Beef jerky needs to be heated to safe temperatures before eating. The USDA advises that beef jerky needs to be heated to 71°C / 160°F. This is the safe temperature at which bacteria and enzymes that would spoil the meat are destroyed. This means that the method we use needs to be able to reach this temperature at the start of the dehydrating process. As the meat dries out the bacteria that could be present become more heat resistant so we need to heat the beef jerky to 71°C / 160°F early in the dehydration process to denature any enzymes and kill any bacteria present. Fortunately, both a dehydrator and even an oven are able to do this. 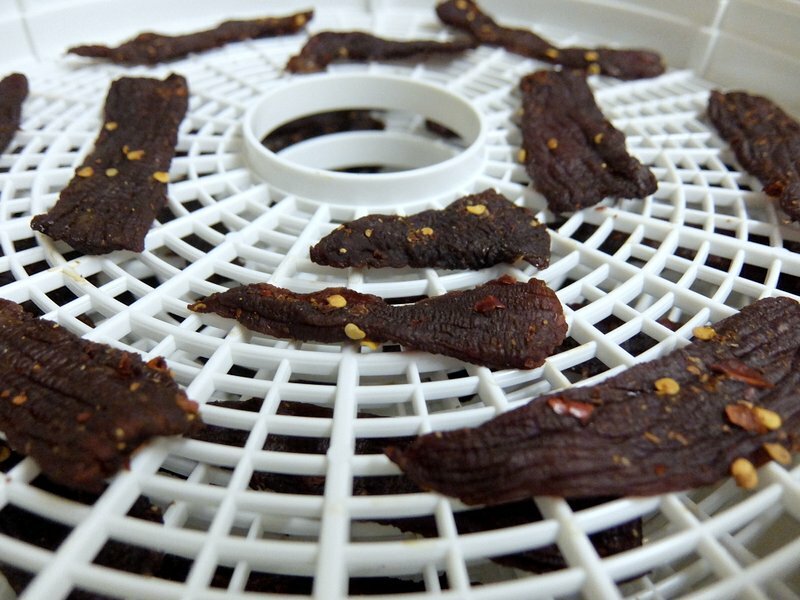 My preferred method of dehydrating jerky is in a food dehydrator which is purpose made for the job. 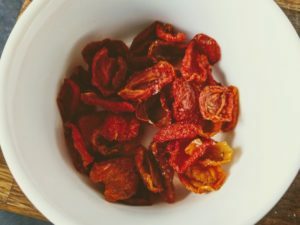 Modern food dehydrators are so simple and convenient to use you will be able to recoup the cost of buying one after making just a few batches of jerky. The key process of temperature and airflow that we need to dry the jerky are designed into every modern food dehydrator. Most dehydrators heat up to 75°C / 167°F and have carefully designed trays and fans to direct airflow throughout the entire appliance. Simply place the prepared beef strips onto the dehydrator trays and stack them in the dehydrator, dehydrate at 71°C / 160°F for between 6 – 12 hours checking every so often to see how dry they are. Using is dehydrator is my preferred method of making jerky and that is how I am going to make this basic jerky recipe. You can, however, dehydrate beef jerky in a conventional fan oven, take a look at this guide to see the difference between the two. This is a basic beef jerky recipe that isn’t complicated but has plenty of flavour in the marinade to make a really delicious finished jerky, better than almost anything you will buy in a store. 1. To begin we need to prepare the beef. Start by trimming away all of the fat and sinew that you can see. This part of the beef will not dehydrate and will considerably shorten the shelf life of the beef jerky. 2. Once the beef has been cleaned up, place in a bag in the freezer for an hour or so. This will firm up the beef ready for cutting into strips for the jerky. 3. After an hour or 2 remove the beef from the freezer and cut into strips with a sharp knife. Cut the beef into strips around 5 – 6mm thick (1/4 inch thick). Cut with the grain if the meat for a tougher jerky with more chew or cut across the grain for a less chewy, softer finished jerky. 4. Place all the strips of beef in a large ziplock bag and prepare the marinade. Mix together the soy sauce, Worcester sauce, honey, chilli, garlic and pepper and add to the beef in the bag. Seal and give a thorough mix around. Return the beef to the refrigerator for at least 6 hours or preferably overnight. 5. After marinating for at least 6 hours remove the beef from the bag and place on some paper towel. Pat dry with a paper towel to remove excess marinade. Arrange the beef onto your dehydrator trays. 6. 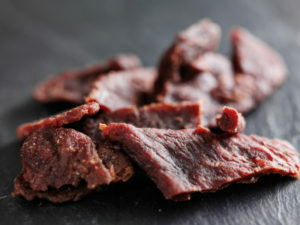 Dehydrate the beef at a temperature of at least 71°C / 160°F, which is the USDA recommended temperature for beef jerky. It will take around 8 – 12 hours depending on your dehydrator. You should check the progress at 8 hours and return for longer if the jerky isn’t fully dehydrated. 7. Once dehydrated allow the beef jerky to cool to room temperature for an hour or two. 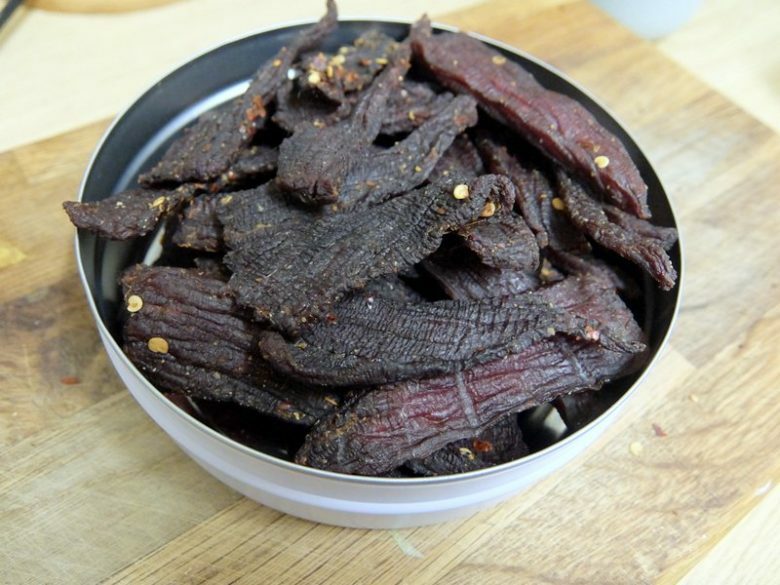 Store the beef jerky in an airtight container in a cool dry place and it will last several weeks or more. For longer storage keep it in the freezer.